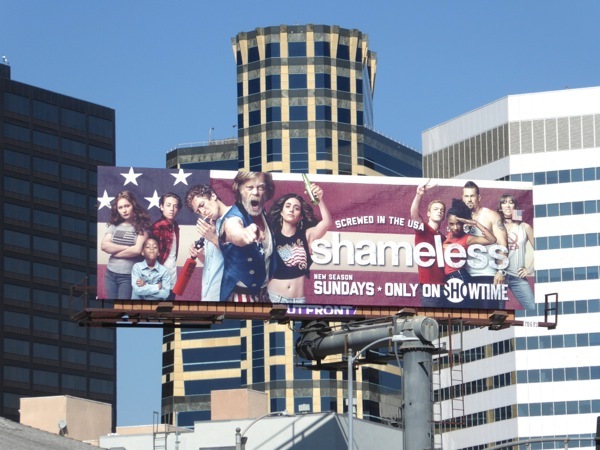 William H. Macy, doing his best 'Uncle Sam' impression, wants you to watch his show. What hasn't happened to the 'Gallaghers' over six seasons of Showtime's Shameless, everything from teenage pregnancies, copious amounts of drugs and drunkenness, aborted weddings, gay encounters, a lot of going up and even being thrown off a bridge. 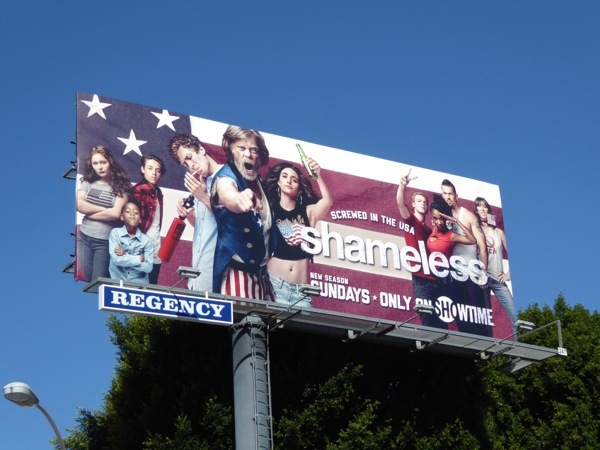 The U.S. remake of Shameless set in Chicago has returned for its seventh season with this almost patriotic ad creative (the original U.K. version set on a Manchester council estate ran for eleven seasons), and it looks like they're picking up on some of the current disillusionment amongst America's population (with its politicians in particular), with the tagline 'Screwed in USA'. 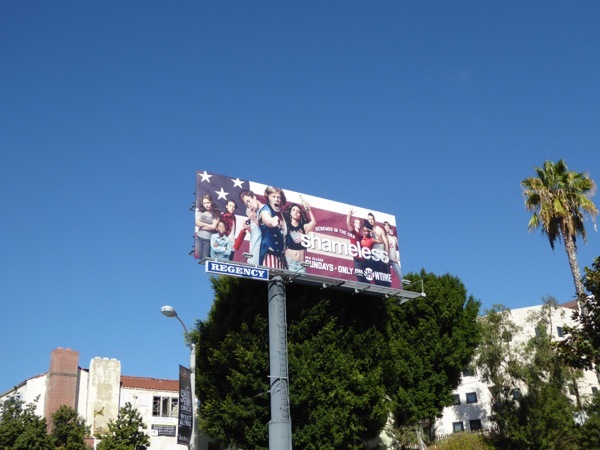 With this being a presidential election year there seem to be even more billboard designs featuring patriotic iconography, like Stars and Stripes and American Eagles, filling the skies in recent months. 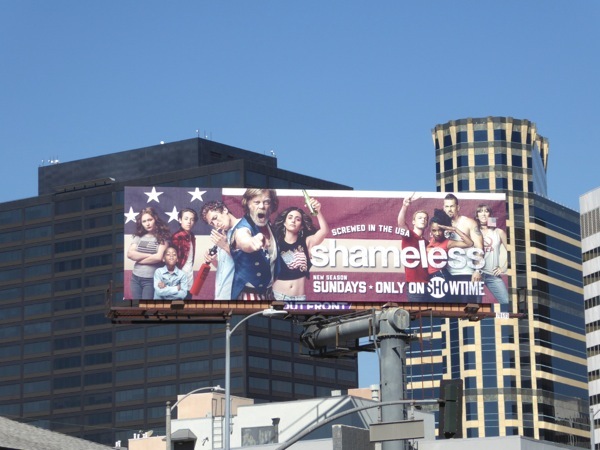 These particular Shameless season seven billboards were snapped along the Sunset Strip on September 26 and above Westwood Boulevard on September 29, 2016. 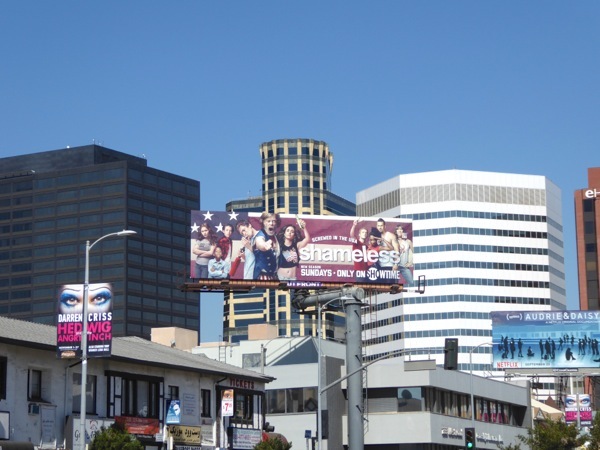 If you're a fan of the show, make sure you also check out these previous season promo billboards for Shameless from around the city skyline from 2010 to date. Now which presidential candidate do you think the eligible members of the Gallagher family would vote for this year, or would they vote at all?